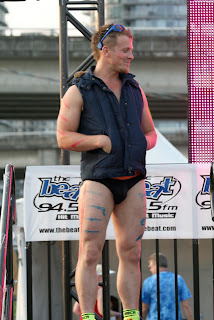 In just over 37 minutes, Twilight star, Charlie Bewley, crossed the finish line at the annual Vancouver Underwear Affair, as the overall first place finisher of the race to help fight cancers below the belt. Charlie, who is best known for his role in the popular Twilight movie series, calls Vancouver as his second home. He primarily lives in Los Angeles, where he has just finished filming two new movies already this year. Bewley ran the annual Underwear Affair in memory or two friends who have recently passed from cancer. He is an avid supporter of the BC Caner Foundation. In 2011, Charlie ran the BMO Vancouver Marathon – running an ultra marathon of a half marathon (21.1km) followed by a consecutive full marathon (42.2km).